What is the meaning of stale documents under letter of credit rules? Understanding the relationships between the date of shipment, presentation period and expiry date. Some letters of credit indicate that stale documents are not acceptable. In rare circumstances letters of credit may also indicate that stale documents are acceptable. But what is a stale document? When does a document set turn into a stale document phase as per latest letter of credit rules? Why an issuing bank adds a phrase when issuing an l/c stating that : “stale documents are not acceptable” or “stale documents are acceptable”. Does ICC encourage or discourage to use the “Stale Documents” term in letters of credit? 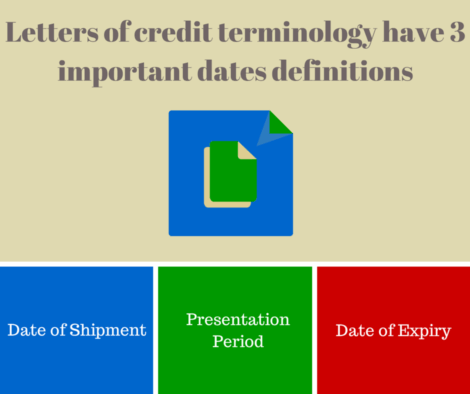 Letters of credit terminology have 3 important definitions in regards to the dates. If you want to understand “stale documents” definition, you should be familiar with these terms. Let me start explaining these definitions with the date of shipment. 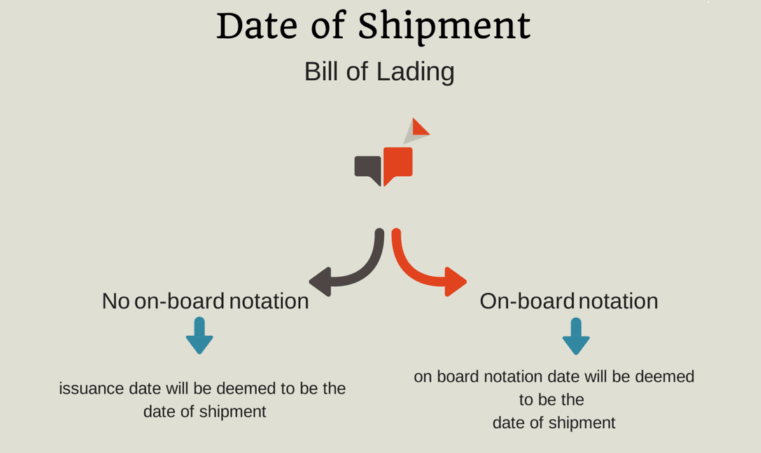 When a pre‐printed “Shipped on board” bill of lading is presented, its issuance date will be deemed to be the date of shipment unless it bears a separate dated on board notation. In the latter event, such date will be deemed to be the date of shipment whether that date is before or after the issuance date of the bill of lading. Do you know the differences between pre-printed shipped on board bill of lading and received for shipment bill of lading? 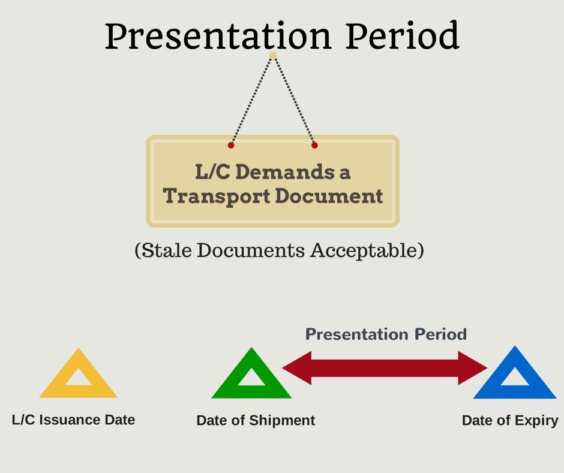 Most commercial letters of credit demand presentation of a transport document. According to letter of credit rules Multimodal Bill of Lading, Bill of Lading, Non-Negotiable Bill of Lading, Charter Party Bill of Lading, Air Transport Document, Road Transport Document, Rail Transport Document and Courier Receipt, Post Receipt or Certificate of Posting are considered to be a transport document. On the other hand documents such as Forwarder’s Certificate of Receipt, Forwarder’s Certificate of Transport, Delivery Note, and Delivery Order are not considered to be a transport document under the latest version of the letter of credit rules known as UCP 600. We can talk about the “date of shipment” term only if the letter of credit requests a transport document. Otherwise date of shipment will not be applicable. According to the letter of credit rules a presentation by or on behalf of the beneficiary must be made on or before the expiry date. 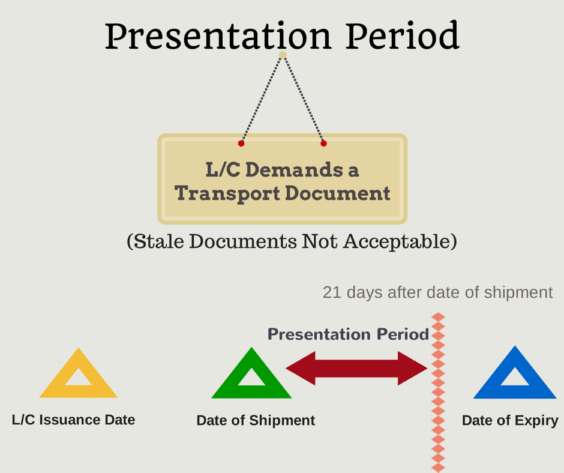 Additionally, UCP 600 states that a presentation including one or more original transport documents subject to articles 19, 20, 21, 22, 23, 24 or 25 must be made by or on behalf of the beneficiary not later than 21 calendar days after the date of shipment as described in these rules, but in any event not later than the expiry date of the credit. These statements from the UCP 600 lead us to the definition of the presentation period. 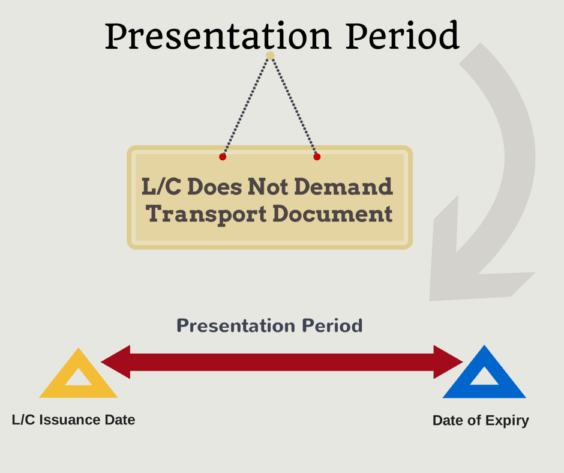 The presentation period can be defined as a period of time which starts with the issuance of the letter of credit and ends either with the expiry date of the letter of credit or else with the expiry of the allowed period time commencing after the date of shipment in case presentation contains a transport document. If letter of credit does not require a transport document presentation, then the documents can be presented by the beneficiary any time between the letter of credit issuance date and the expiry date. If letter of credit requires a transport document presentation, then the documents must be presented by the beneficiary within a certain time frame after the date of shipment. UCP 600 defines presentation period as 21 days. As per UCP 600, a presentation including one or more original transport documents subject to articles 19, 20, 21, 22, 23, 24 or 25 must be made by or on behalf of the beneficiary not later than 21 calendar days after the date of shipment. 21 days period can be decreased or increased by the issuing banks. Exporters must look at the “Field 48: Period for Presentation” in order to determine the exact presentation period under a specific letter of credit. 21 DAYS AFTER SHIPMENT DATE BUT WITHIN LC VALIDITY. 21 DAYS AFTER SHIPMENT DATE BUT WITHIN CREDIT VALIDITY. 21 DAYS FROM THE DATE OF BILLS OF LADING. Expiry Date is the latest date for presentation of documents for payment, acceptance, or negotiation under a letter of credit transaction. Exporters must complete their presentations before the expiry dates. After the expiry date, the letter of credit will be perish. The issuing bank will be relieved all of its responsibilities, if no presentation has been made until the expiry date. In case of partial shipments non-utilized portion of the letter of credit will be vanish after the date of expiry. ISBP 745 states that “stale documents acceptable” phrase should not be used in a letter of credit, as they are not defined in UCP 600. If “stale documents acceptable” stated in a letter of credit, then documents may be presented later than 21 calendar days after the date of shipment as long as they are presented no later than the expiry date of the credit. This will also apply when the credit specifies a period for presentation together with the condition ”stale documents acceptable”. ICC’s above explanation reveals that “stale documents” term should be used in conjunction with the situations in which letter of credit requires the presentation of a transport document. In most cases “stale documents not acceptable” condition can be seen in the documentary credits. But this condition has no effect and meaning in a “letter of credit” transaction as a result issuing banks should refrain to use it. PACKING LIST IN TRIPLICATE SHOWING DETAILS OF PACKING. STALE DOCUMENTS NOT ACCEPTABLE UNLESS AUTHORIZED BY US. Beneficiary presented the documents to the nominated bank on 23rd of August.2014. The bill of lading which was presented by the beneficiary had an on board date 01.August.2014. The issuing bank refused the documents based on stale documents discrepancy, because documents have not been presented within 21 days after bill of lading date. Previous articleWhat is Business Identifier Code (BIC) and International Bank Account Number (IBAN)? Next articleWhat are the differences between received for shipment bill of lading and pre-printed shipped bill of lading?